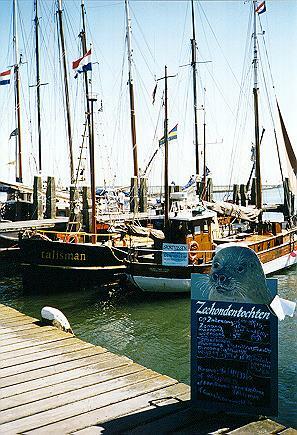 With the family we spent the holiday by 'Island Hopping' along the dutch Wadden islands in the north of our country. We visited five islands, moving from west to east, and stayed 2 or three days on each island. We biked a lot, walked through the sand and in the sea, admired nice places in the villages, and liked the dinners each evening at some restaurant. Usually we finished the day with playing May-jong. Each crossing between the islands meant a nice boattrip, because our 12 days in the first two weeks of August were the only nice sunny weeks this sommer. Of course we did see some seals. Our trip was booked via SNP Natuurreizen. 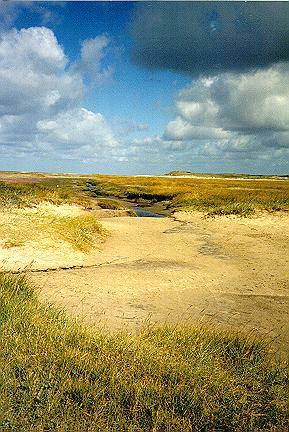 Wadden Island Hopping is possible from west-to-east and in the reversed direction. We had chosen for the first option and also for the long version: i.e. all major islands were visited (a shorter trip is also possible, in which only the three most western islands are dealt with). Our direction was the busy direction, but that caused no problems. Nobody had to wait, and even bicycles could be stored on the boats too. 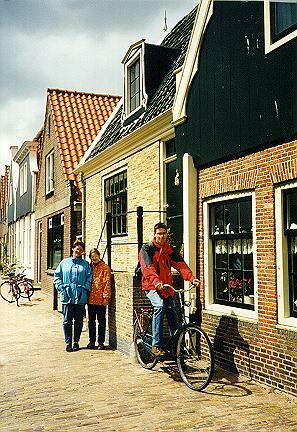 We were traveling with backpackings and we hired bicycles on the islands. Only on Ameland there appeared to be a shortage of cycles - due to the many reservations made in advance by "day-trip-visitors" from the mainland. 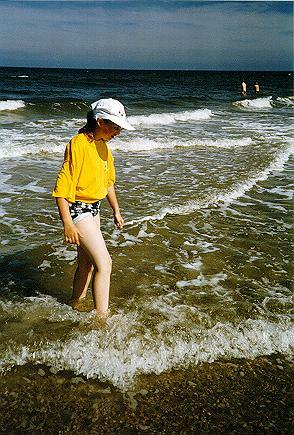 We stayed at hotels/pensions that were of a quite different quality (but it is also possible to use campings). 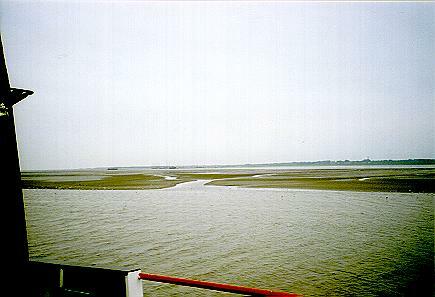 The trips to or from the ferries were done by taxi or by public bus. Texel: Hotel-Pension Rebecca (De Waal). We arrived at Texel by train and the regular ferry from Den Helder. At the Hotel we obtained three bikes. 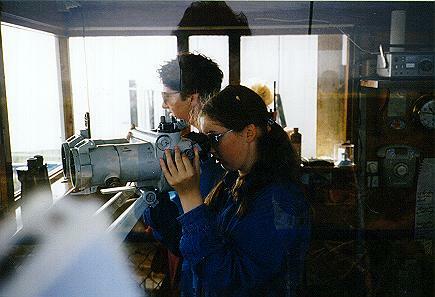 The fourth was found at De Koog that was only 4 Km away. We had two days to see the island. When we arrived we had a lot of wind, and even some rain, but the next morning the sun appeared. 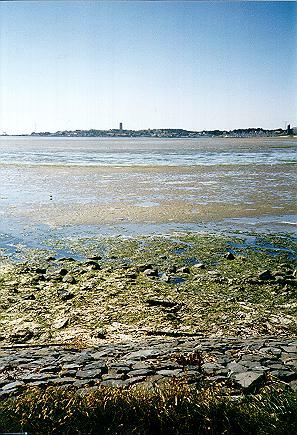 That also implied a tour to the Slufter, the sea inlet at the north-west of the island. Here we made a nice walk to the sea, admiring the many colors of the sky, dunes, beach and the sea. After this we visited Ecomare (a seal centre south of De Koog) - here is the only part were you can bike through the dunes. On Texel most cycle pathes are found on old dikes (luckely with some wild hedge of trees that is pleasant when there is wind) through the green part of the island. The next day Oudeschild was a must to us: a nice harbour, but also the house ('Huis met De Stoep'), where Corrie her great-grandparents had lived in the 1930-s, had to be seen again. We admired the nice houses here that are quite a contrast to the poor condition of the small, old and white Dutch-reformed church behind them. 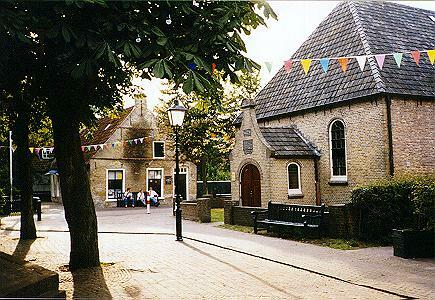 A floorstone on the grave of a great-great-grand-father (Pieter Visman) of Corrie can still be discovered inside this church. In this area we are more than just a tourist. 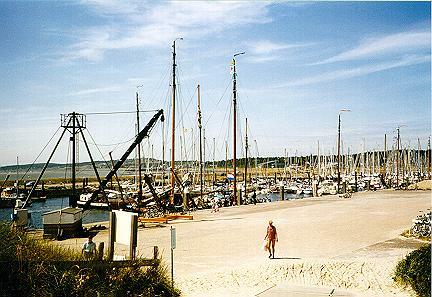 In the afternoon, after a 2nd visit to Den Burg, a taxi brought us to the tiny anchoring-place (just north of De Cocksdorp at the north of the island), where MS De Vriendschap maintained the ferry to island Vlieland (leaving at 17.00h). Both landingplaces you expect to tremble in a 3rd world country ... The boat itself was small too. Everyone had to stay on deck and we became quite wet after some plunges by the waves. It was by far the most adventureous boat trip we had during our tour. 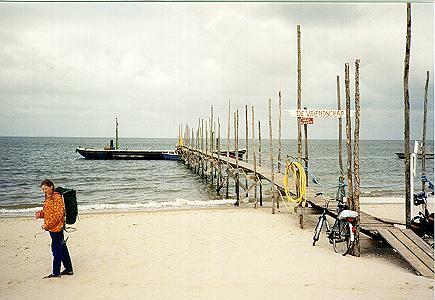 Vlieland: Hotel Golfzang (Oost-Vlieland). A beach taxi brought all people from the Vliehors to the old Post House, where we were quite lucky to share a 2nd taxi with others (the last bus we had planned to take already had left the area an hour before). Hotel Golfzang appeared quite comfortable to us, we made a nice walk through the village, met very surprisingly our former neighbours of our former house (in Utrecht), and had finally the dinner we longed for. The next day we had a nice cycle tour over the island, we visited the lighthouse, the beach at the North Sea side (where a lot of wind was blowing over the sand), and finally the harbour (from where you can already see the next island, Terschelling). 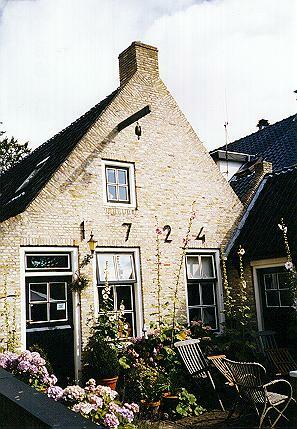 Terschelling ('Schylge'): Hotel Bornholm (near the Dellewal). The ferry to Terschelling was by Katamaran, which maintains a regular (and quite luxury) connection between the two islands (to add some tension: they don't accept your vouchers, you have to return to the Tourist Office to change it for a ticket ...). 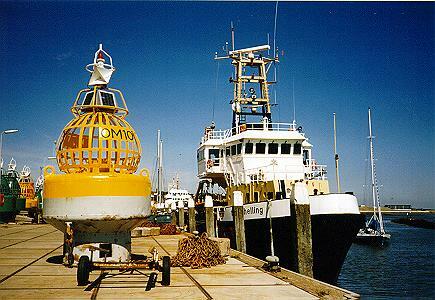 Just east of Vlieland the Vlie has a depth of more than 30m! We arrived at the Hotel Bornholm when it was still morning - too early to get a room. This Hotel appeared to be the best of all. We stayed three nights here. West-Terschelling was a nice place to walk through, to have views to or over from the surrounding dunes (looking back, Vlieland showed a vulcano-like shape). Again we met our former neighbours who were staying here too (and who made yesterday a day trip to Vlieland). 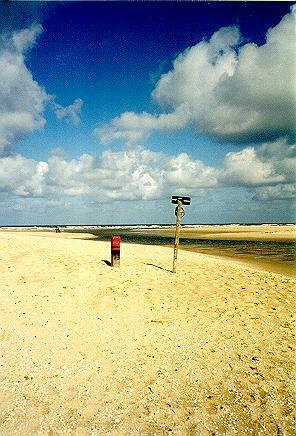 We cycled a lot over the island and admired the views to the beach at the north from West aan Zee and to the south over the Wadden Sea. The harbour offers many nice scenic views too. 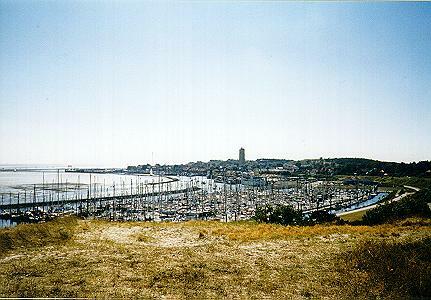 The best view to West Terscheling is found in the late afternoon at the Dellewal (just near the Youth Hostel). Now even the Wad gets a nice purple colour. 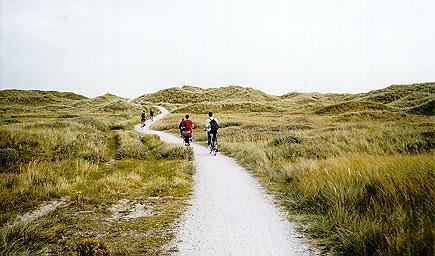 Ameland: Hotel Noordzee (Nes). 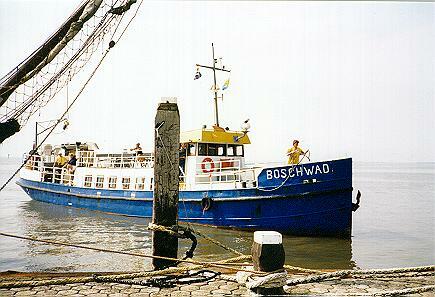 The MS Ameland maintains a 4 hour long connection to Ameland. Each time it is a surprise where it will land. We had to walk for more than a Km - luckily we had backsacks, which meant that we had to help other people with very heavy bags too. 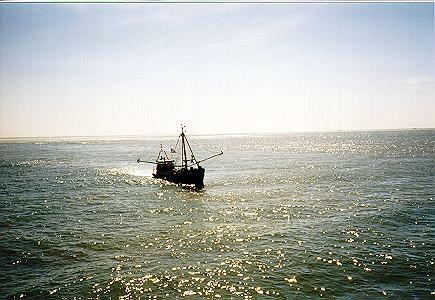 Because of the long trip, the boat can not wait very long, because otherwise the Wadden Sea becomes "dry" again. Indeed the route turns each times following long and narrow curves. We had a bright sunny afternoon and had the luck to see several seals too on the sands between Terschelling and Ameland. The Hotel was a desillution: a very poor one. And as mentioned already before, we were also not able to hire bikes. But there were some nice streets to view in the evening in Nes. The next day was extremely hot with nearly no wind. Along the south dike we made a walk to Hollum in the west. Here again, we saw many old houses. A hot bus brought us back to Nes. Schiermonnikoog (`Lytje Pole'): Hotel Van der Werff. 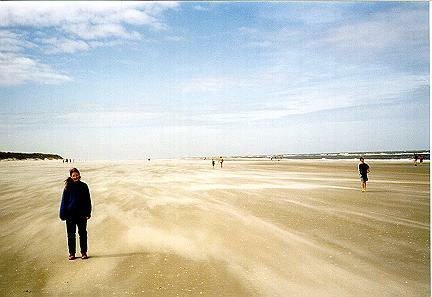 Also the connection between Ameland and Schiermonnikoog, by MS Boschwad, required a 4-5 hours. 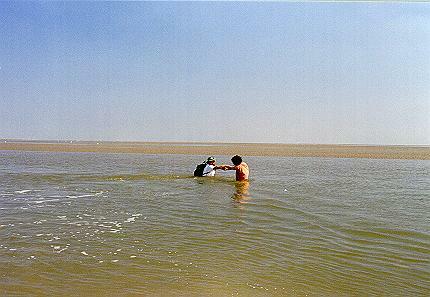 Here we passed the point where Walter and I in June had "walked" (Wad-walking) from the mainland to Ameland, with a proud group when we all reached the island in time. This time there was no wind - but it was quite convenient on the boat. The Hotel (the former residence of the Stachhouwer family, who ruled the island like kings many years ago) is quite a place! 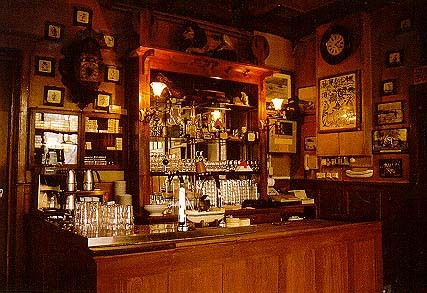 It is famous, it had famous visitors, it looks old with style - but downstairs only. We had the luck to get two very new luxurious appartments behind the Hotel, but others were less fortunate: they got tiny rooms under the roof, rooms that were not reached by the warm water and where the toilet was so narrow that the door could not be closed when you were using it. Well, they feld how the Stachhouwer family treated chambermaids in the early times. Return to: Jan ter Maten's Home Page.